NASA’s Curiosity rover wasn’t the only presence on Mars this week. To premiere his latest single, “Reach for the Stars (Mars Edition),” Black Eyed Peas frontman Will.i.am partnered with NASA to beam the orchestra-laced track to the rover while it traveled to the Red Planet. Upon landing, Curiosity transmitted the song back to the Jet Propulsion Laboratory in La Canada Flintridge, Calif., where Will.i.am debuted the cut for NASA officials, JPL personnel, VIP attendees and 53 students from his hometown of Boyle Heights, Calif. The transmission of the song from Mars to Earth took nearly 15 minutes. The unusual premiere speaks to Will.i.am’s larger initiative to inspire students and young people to cultivate an interest in science. At the JPL event, the artist, born William James Adams Jr., also announced a partnership between his i.am.angel Foundation and digital resource provider Discovery Education for a program called i.am.STEAM, intended to bring science, technology, engineering, art and math (or STEAM) to K-12 classrooms around the country. Will.i.am isn’t the first musician whose music cracked Earth’s atmosphere. The Voyager deep-space probes, launched in 1977, house a copy of Chuck Berry’s “Johnny B. Goode,” for instance, but Will.i.am became the first to have a song on Mars. He initially connected with NASA after buying a $5 million time block on ABC for the back-to-school one-hour TV special “i.am.FIRST-Science Is Rock and Roll” last August. (The special was filmed at the 2011 FIRST Robotics Championships for kids.) After the show, NASA administrator Charlie Bolden was piqued by Will.i.am’s educational initiative, inviting him to attend the Curiosity launch at Cape Canaveral in November and putting in motion the idea to beam an original song on a 708 million mile round trip between Earth and Mars. Will.i.am set to work on the track, enlisting a 40-piece orchestra, two youth choirs and producer/rapper Lil Jon, who contributed additional vocals. But the song’s main goal was to engage the next generation in continuing science education. “We realize that as cool as this is, there was a lot of work that needs to be done in terms of STEAM education here on Earth,” i.am.angel Foundation executive director Justin Paschal says. Shortly after the song’s out-of-this-world premiere, “Reach for the Stars” was made available to streaming services like Spotify and to iTunes. The track’s high-profile launch coincides with the upcoming release of Will.i.am’s often-delayed solo album, #WillPower, due this fall on Interscope. Will.i.am wouldn’t confirm that the song will end up on the album, which reportedly features guest appearances from Britney Spears, Nicole Scherzinger and Rihanna, instead saying that the focus is more about using music to highlight his mission. 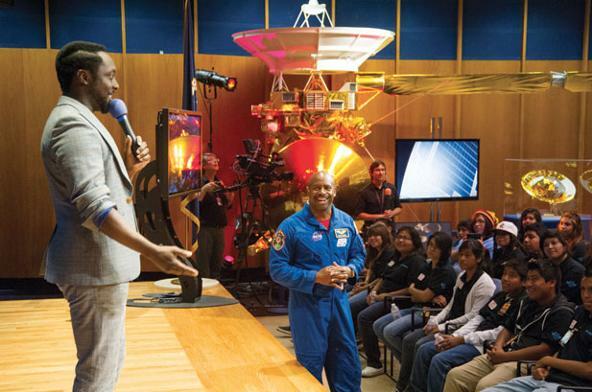 While the initiative stirred up media attention, Will.i.am is more focused on continuing his relationship with NASA, hoping that more will join in his efforts.